LONDON–(BUSINESS WIRE)–The increasing need for connectivity in today’s world is evident from the increasing sale of mobile devices and related accessories. Among mobile accessories, headphones are the most popular. Modern age back-to-school shopping involves less of stationery and more of advanced technology. As educational institutions seek to leverage technology in the teaching-learning market, students need to be equipped with personal learning devices such as mobile phones, tablets, and laptops. Headphones are necessary for appropriate utilization of each of these devices in clearly demarcated headphone zones across the school campus. The global headphones market is swamped with choices for young consumers. Students heading back to school can choose among different products by type and by technology. The market offers different types of headphones ranging from in-ear, on-ear, or over-ear models with wireless or wired technology. Consumers also have the choice of non-smart headphones or smart headphones. 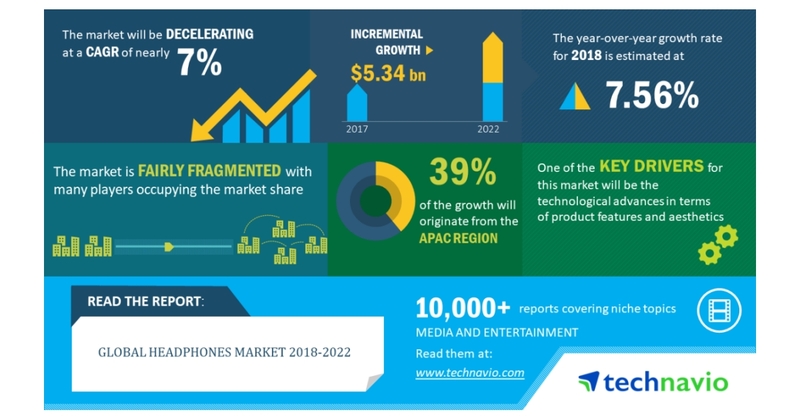 Market research analysts at Technavio forecast that the global headphones market 2018-2022 will post a CAGR of close to 7% over the forecast period. This market research analysis highlights increasing demand for sports headphones as one of the key drivers in the headphones market. Vendors are developing innovative products to cater to the needs of the consumers. The global headphone market is dominated by key players such as Apple, BOSE, and Samsung Electronics, among others. The introduction of innovative and technically-advanced headphones will motivate consumers to adopt them for their personal and work use. Market research firm Technavio has identified technological advances in terms of product features and aesthetics as factors that will bring traction to the market. The incorporation of new technologies such as spatial sound and bone conduction are expected to lead to the growth of the market in the coming years. Technavio’s market research provides a competitive analysis of the market by type (in-ear, on-ear, and over-ear headphones), by technology (wired and wireless headphones), by product (non-smart and smart headphones), and by geography (the Americas, EMEA, and APAC). This research report also provides a thorough understanding of the market augmented with actionable insights. The report is designed to help market players refine their strategies and secure a bigger share of the market during the period 2018-2022.